From river otters and minks to bobcats, pikas, and flying squirrels, California boasts a diverse and intriguing fauna. But many of these animals can be secretive, shy, and nocturnal and observing them in the wild can be difficult. 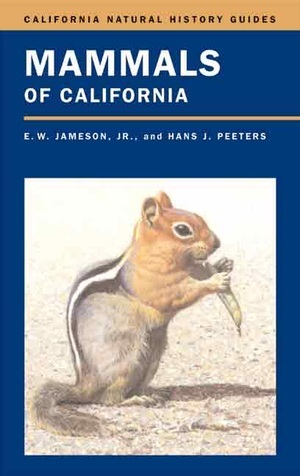 During the past two decades, the first edition of this popular guide introduced thousands to California's mammals by describing techniques for recognizing their presence, and when possible, methods for watching them in their natural habitats. Mammals of California is now completely revised and updated throughout, making it an ideal companion in the field or classroom. E.W. Jameson, Jr., is Professor Emeritus of Zoology at the University of California, Davis, and author of Vertebrate Reproduction (1988) and Patterns of Vertebrate Biology (1981). Hans J. Peeters is Professor Emeritus of Biology and Zoology at Chabot College. His illustrations have appeared in Birds of North America (1997) as well as in several other bird guides, and he is author and illustrator of the forthcoming title Raptors of California (2005).